Ensuring optimal network performance 24/7 is critical to business success, irrespective of whether you are small or big. This paper examines the basic functionality of any network management solution required to achieve the optimal network performance goal. And we will also focus on how ManageEngine OpManager provides these essential functionality at low cost. Auto-discovery and mapping of all critical network elements such as mail servers, WAN links, business applications, and entire LAN infrastructure including switches, printers, wireless routers, load balancers, and non-standard devices if any. 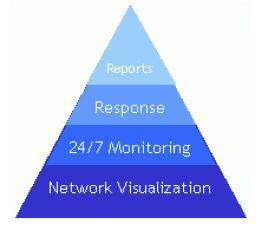 24/7 network surveillance for detecting network faults. Monitoring critical resources for availability, threshold violations, host resource (CPU, Disc space, Memory) utilizations, service availability, service response times etc. Ability to send notifications and take automated remedial actions by executing custom scripts. Reports that help answer questions such as how many service outages occurred for all systems monitored that provide service to Atlanta branch office? Whats the percentage of free space on all file servers across the entire network? etc. Grouping of devices into routers, wireless, switches, servers etc. Network discovery automates the process of identifying each manageable element of your network and adding it to the monitoring software for further monitoring. Network discovery is a very basic functionality that every network monitoring software offers. But do checkout how much of information your network monitoring tool collects during this discovery process. Does it discover your most critical server as just another IP device? Or does it identify it as a Dell Server, connected to port 21 of Switch 2 in second floor, running oracle and http, with temperate of x degrees, CPU utilization of 70%, free disc space of 30% , transporting data at x kbps per second etc. Knowing what is actually happening under the hood gives you better visibility into the root cause of problems when they occur. The second important aspect of discovery is grouping the discovered devices into routers, switches, servers etc., separately. This helps network engineers to quickly access the relevant groups while troubleshooting. Maps or custom views help get the big picture of your network. For example, imagine a small business enterprise headquarter in California with branch offices in Texas and Atlanta. The graphic below illustrates how a network management tool helps in visualizing such a scenario. The icons as well as the links shown here reveal real-time status and provide instant information on what is up and what is down right at the moment. Moreover, these icons and links can be clicked to drill down for more details. Different organizations have different network components installed. As an IT Manager, the first thing that you should do is to prepare a checklist of devices that need monitoring. Then look for a network monitoring software that helps you monitor all these from a central console. You should also look for software that allows custom device monitoring. Say your UPS devices or any other IP based device. - Paul Chan, Infrastructure and Operations Manager, Universitas 21 Global. Availability monitoring tells you which devices are up and which are not. This is very basic to an extent that there is no point discussing it further. The statement below from an IT Manager captures the essence of proactive health monitoring. Every IT Manager wants to know failures in advance so that it can be prevented. A good network monitoring tool should help in monitoring the health of critical devices and alert the operators when health deteriorates. Automated polling of various devices for multiple health parameters is essential. For example: You can configure your network monitoring software to continuously monitor the free space available in a file server so that the users dont suffer when it runs out of disk space. This is the second most basic functionality in any network monitoring software. As an IT manager you should look for a software that can help you send emails to the right person at the right time. Say all SQL related notifications should be sent to John and all servers related notifications should be sent to Alan. If notification is very critical to your business, you should also look for software that can integrate with SMS engines that help you continue the notifications even if the mail server goes down. OpManager supports integration with major SMS engines that allows SMS notifications to be sent directly to your phones without requiring your company mail server. Though notifications are effective, its not always the best solution. For many situations it is preferred that you let the monitoring system attempt to remedy the problem on its own before involving a human. For example, a service might fail often and would require a simple restart every time. Suppose that you have a printer server on which a particular service hangs. Each time it hangs someone should restart the service. The right network monitoring solution might be able to perform the restart for you. Automated remedial action is the next level of maturity and sophistication in a network monitoring system. Today, most IT teams have in-house programming expertise, to write custom scripts on VB or Perl. Clubbed with their knowledge of API and COM interfaces to various system management technologies such as Windows Management Instrumentation (WMI), Active Directory Service Interfaces (ADSI) these IT pros can write scripts that ease the job of administrators when they have to repeat lengthy procedures in fixing a problem every time. OpManager enables executing such custom scripts on the occurrence of network trouble. You can assign a script to a particular event so that OpManager triggers the script and eliminates the need for manual intervention. IT services teams rely on Help Desk or trouble ticketing software to streamline their work. Tickets raised for various problems are assigned to respective operators and are tracked for closure. As an IT Manager you can also make use of this process and configure your network monitoring software to automatically generate tickets to the appropriate resource. This saves time and also helps in knowledge sharing. For ex: How do you free up your most experienced resources from troubleshooting ordinary problems? The simple way is to document the procedures to fix the problem once so that next time it can be done by junior level technicians. Few trouble ticketing software help you build an effective knowledge base over a period of time. ManageEngine ServiceDesk Plus  A web based help desk tool meant for IT services pros. You can automatically generate a ticket in ServiceDesk Plus by integrating it with ManageEngine OpManager. With this duo in action, you can free up your critical resources to take up larger and strategic projects leaving behind network monitoring related problems to juniors. To achieve the goal of optimal network performance 24/7 you should continuously measure key parameters through reports. Questions such as how many service outages happened in the past 90 days, how many times did the exchange server crash in the past 6 months, what is the % of network availability in the past 1 month, how many failures happened in the peak hours in the last 3 months etc., help IT Managers to identify the trend and plan for optimization. ManageEngine OpManager helps IT Managers to generate numerous reports for different time periods. The server availability report for a month, the utilization pattern on Atlanta office for the past 6 months, the availability report on Texas office for the past 3 months etc. To manage your network you must first monitor it. Network monitoring is key to ensuring high availability of your networks and applications. A comprehensive network monitoring software such as ManageEngine OpManager could save you from network outages and help saving lot of IT dollars. For more details on ManageEngine OpManager visit http://www.opmanager.com and to understand how it can help you manage your network, systems, and applications seamlessly, please contact .